If you are thinking of investing in a walking aid, either for yourself or a loved one, you may want to consider a rollator. Rollators, or wheeled walkers as they are also known, are invaluable for anyone with mobility and/or balance issues. The use of a rollator can help someone to maintain a degree of independence and subsequently boost self-esteem. 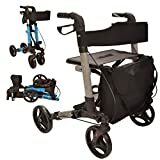 Indeed this type of mobility aid can mean the difference between an individual being able to remain in their own home or not. 2 Who needs to use a rollator? 3 What are the differences between a walker and a rollator? Simply put a rollator is a walking aid with a wheel at the end of each leg. These wheels feature air-filled tyres and sizes vary according to intended use. For example, larger wheeled versions are more sturdy and therefore suited to rougher terrain and outdoor use whilst smaller wheeled models are lighter and more easy to manouevre making them ideal for home and indoor use. Rollators are available in both three and four-wheeled versions and other features can include parking brakes, height adjustable handlebars, shopping basket and a seat, ideal for anyone needing to take a break. Who needs to use a rollator? What are the differences between a walker and a rollator? The rollator has quickly established itself as the best selling walking aid on the market today. Sales of the popular wheeled mobility aid have steadily increased overtaking those of the more traditional walking or zimmer frame despite being more expensive. The main advantage that a rollator has over its contemporaries is that it has a wheel at the bottom of each leg. These wheels make the rollator easier to use and manouevre than a standard walking frame, rolling along the ground without the need to be lifted with each step taken. 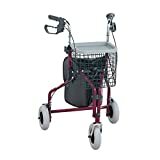 In addition a rollator supports the whole body evenly distributing its weight. Other advantages include the option of a seat and/or cross bar for back support if required. For ease of reference we have outlined the main differences below. Has four legs. No wheels. One of the first considerations when purchasing a rollator is how many wheels do you choose. Rollators are available in both three and four wheeled versions according to intended use. Here we have highlighted the main differences between the two. Seats. Is it important that your rollator has a seat? Seats are only available for four-wheeled options and it is advisable to choose one with an adjustable seat height. Consider comfort too. Padded, contoured or sling style seats are preferable to hard plastic ones. Width. Take care to measure the width of the rollator especially if it is intended for use indoors in tight spaces. Bear in mind that most four wheeled rollators are wider than 22″ the width of a standard bathroom doorway. Weight. It is important to check both the weight capacity of your rollator to ensure that it can give you full support, and also the weight of the equipment itself. The latter is particularly important when lifting it into a car or up stairs regularly. We hope that our buying guide has helped you decide which sort of rollator is the right one for you. Take a look below at some our favourites. By now you should have all the facts you need to choose a rollator. However if you’re looking for further information on the benefits of using a walking aid then click here.